NOTES: Resin with photo etch frets and vac canopy. The de Havilland DH 112 Venom was a British postwar single-engined jet aircraft developed from the de Havilland Vampire. It served with the Royal Air Force as a single-seat fighter-bomber and two-seat night fighter. The Venom was an interim between the first generation of British jet fighters – straight-wing aircraft powered by centrifugal flow engines such as the Gloster Meteor and the Vampire and later swept wing, axial flow-engined designs such as the Hawker Hunter and de Havilland Sea Vixen. The Venom was successfully exported, and saw service with Iraq, New Zealand, Sweden, Switzerland and Venezuela. The Venom was built as two night fighter variants. The first was the NF 2 night fighter, first flew on 22 August 1950 and entered service in 1953, having been delayed after some minor problems with the type. To accommodate the necessary two man crew (pilot and navigator/radar operator) it was structurally different – the two crew were positioned side-by-side and an airborne interception radar was fitted in the nose. It replaced the Vampire NF 10, and was followed by NF 3, which was the last night fighter variant of the Venom, first flying in 1953 and entering service in 1955. 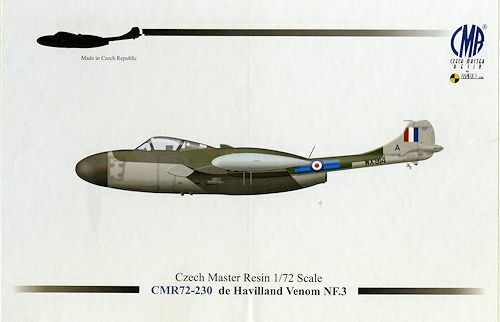 It had a relatively brief career with the Royal Air Force, having been only an interim solution, and was withdrawn in 1957 and replaced by the Gloster Javelin twin-engined all-weather fighter. This is the last CMR kit of the founder, Petr Buchar, who has retired and turned over the company to Mark I Ltd. All of us who have every built one of Petr's kits are glad that he started the company as he took resin kits to new heights of accuracy, engineering and completeness. This Venom kit is very much the pinnacle of his dedication to the hobby. Molded in a dark grey resin, the molding is flawless and has a level of detail that can only be reached with quality resin. There is a small amount of thin flash on a few parts and some pour stub areas that will need to be sanded down on the large parts of the kit. Despite being carefully packaged in a compartmentalized bag, the international postal service's gentle handling of the mangled package I received ensured that some of the very fine pieces were broken as the box was tossed around in the process. The kit comes with color photoetch from Eduard so you know it is of a high quality. P.e. is used in a variety of placed such as instrument panels, side console tops, seat harnesses, intake splitters, oleo scissors, external probes and the like. A second smaller fret has the wing fences. The builder will be spending some time in the cockpit as there is quite a bit of detail to be added there. A bit of scratch building is required in terms of a wire brace or two on the aft bulkhead, but nothing beyone any modeler who is at a level to build one of these kits. Each of the wings is a single piece with superb wheel well and wing framework detail under the area of the separate flaps and speed brakes. The tip tanks are molded into place. Fuselage is split vertically and there is room for the weight you will need with this one so pack it tight. The nose wheel well is a separate piece so no worries about an unfixable seam running down the middle of it as you find with so many other resin kits. The landing gear is very nicely done with finely molded retraction struts and gear doors. As mentioned, the flaps and speed brakes are separate so you can model them open or closed as you choose. You get two different styles of flaps; one is a single piece that includes a curved section to go over the boom and the other is split into pieces on either side. The kit includes a pair of vacuformed canopies with Eduard masks. Those who have used these masks realize the they only cover the outer edges of each frame, the modeler expected to fill in the center part with liquid mask. Wheel masks are also provided. As mentioned earlier, sections of wire will need to be cut for the various straight antennas. Instructions are some of the best around with color information provided for areas during construction. There are several pages of overall and detail photographs of the NF.3 to assist in construction. Markings are for four aircraft, all in the same camouflage scheme of Dark Green, Dark Sea Grey over Medium Sea Grey with black radomes. The first option is with 23 Squadron at Coltishall in 1955. This aircraft has silver tip tanks with tiny red and blue bands over the very rear tips of the tanks. Second is an 89 Squadron plane from Stadishall in 1956, also with silver tip tanks. With Medium Sea Grey tanks is a 141 Squadron plane also at Coltishaw in 1955. The final option is a 151 Squadron plane with the grey tanks at Leuchars in 1955. The decals are very nicely printed and you get a huge data markings sheet to go with it. 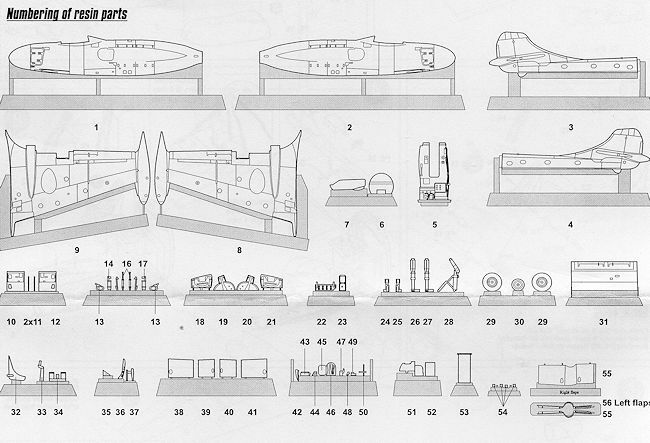 An additional two pages are included to show the placement of all those markings for modelers who want to apply them all. Please note that all paints on this plane are gloss. 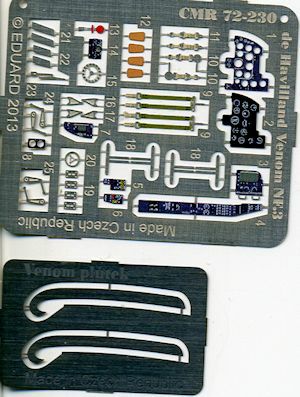 Petr told me in the letter accompanying this kit that one of his goals was to produce a kit of every Vampire/Venom variant, and that he has done with the conclusion of this one. 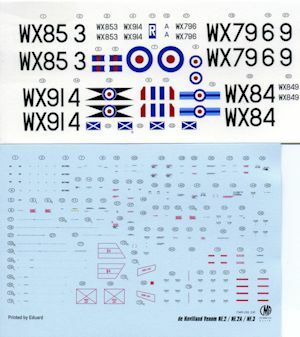 If you are also of a like mind and have a penchant for the last of the centrifugal flow UK fighters, this is a kit for you. Review kit courtesy of CMR. You can get yours at your local retailer or have them order it for you.